If you have a United States post office address, Project Restore will be happy to send a complimentary copy of this magazine to you (limit = one copy per person). Please use this form to make a request. If you don't have a U.S. address (or even if you do), we invite you to read Remember online (just click on one of the article titles to the right). 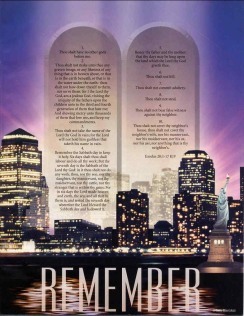 The Remember magazine is also published under the title A Time for Joy. The magazine contents are the same, only the front cover is different. A 32-page magazine, heavily illustrated. Copyright 1998 by Family Heritage Books. Compiled and edited by Brian Jones. The text of this book is selected from the writings of Ellen G. White except where otherwise noted. The section "Thought Questions Answered" is adopted from materials published by Amazing Facts, Inc. Used by permission. Texts credited to NIV are from the Holy Bible, New International Version, copyright 1973, 1978, 1984, International Bible Society. Used by permission, Zondervan Bible Publishers.